Water contamination can reduce the life of lubricants and increase the frequency of maintenance and repairs. If corrective action isn’t taken before an out-of-limit incident occurs, operational costs can escalate. When unplanned maintenance disrupts operations, productivity suffers and technicians may focus on a quick fix instead of the root cause. To detect water contamination in oil systems, in-line capacitance probes can be used. These flexible, off-the-shelf devices provide automatic and continuous monitoring. Yet checking moisture levels isn’t just about enhancing reliability or eliminating corrosion. In-line capacitance probes improve operations by supporting a proactive approach to maintenance. Oil typically has a dielectric constant in the 2 to 5 range. By contrast, water has a dielectric constant of 80. Given this sizable difference, even a small amount of water will affect the water-state reading in an oiling system. 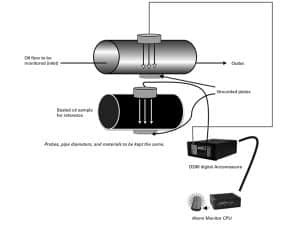 Capacitance probes that are molded to the shape of an oil-filled tube can measure the dielectric field and connect to a sensor signal conditioner with a digital-limit alarm module. For example, in-line capacitance probes from MTI Instruments connect to the Accumeasure Digital Capacitance System. One capacitance probe is placed against a non-conductive section of tube that carries the oil supply. A second, reference probe is placed against a sealed, non-conductive tube that contains a sample of the lubricating oil. Both tubes remain in thermal contact with each other. Each capacitance probe measures the dielectric field between the face of the probe and a grounded plate on the opposite side of the tube. A monitoring CPU triggers an alarm if the dielectric field reading for the oil flow channel differs from the reading for the sealed oil sample. The Accumeasure Digital Capacitance System is immune to thermal drift and easily calibrated for oil-in-water sensitivity.